The haunting hoopla accorded a certain middle-aged pop star's death recently disturbed me. And it disturbed me on several levels. In terms of a frenzied media it was O.J. on the Los Angeles freeway all over again. Coverage to the point of saturation. Speculation to the point of inanity. Meanwhile, the level of devotion, adoration and idolization amazed me. Thousands were interviewed, millions from his music back-catalogue were sold and BILLIONS tuned in around the world to his memorial. An emotional outpouring on such a level is virtually unprecedented. Who else could have garnered such attention? We can think back to Lady Di's funeral but apart from that nothing comes close. It's odd who we choose to idolize. Why Wacko Jacko? Why don't we place all our devotional powers in traditional religions and their deities? Well for Catholics, at least, lapsed and the few remaining, Pope Benny isn't exactly a charismatic figure. Why don't we worship our politicians? Heck, with guys like South Carolina Governor Mark "Don't Cry For Me, Argentina" Sanford and former Illinois Governor Rod "Money - That's What I Want" Blagojevich I guess I understand why. Why don't we worship steroid junkies, er, ah, athletes? Next question. Here in Canada, I can't think of anyone that could engender the same kind of idol-tery. We've had a succession of bland, uninspiring Prime Ministers and uncharismatic Premiers. We have some mildly entertaining performers and artists. Although I love Leonard Cohen, Neil Young and Gordon Lightfoot I don't think their passing would match the reaction the self-proclaimed King of Pop received. 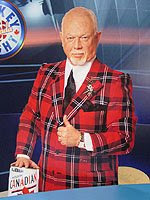 Don Cherry, that hockey analyst blowhard, is about the closest thing we have to an icon. His shtick is sheer buffoonery and his sartorial sageness is somewhat lacking but hockey-loving Canadians adore him and want to draft him to run for Prime Minister. I can just see his approach to diplomacy with his elbows up in the corners. But wait, speaking of hockey, I know just the man who inspires in Canadians what Mister Jackson did for Americans. That idolized purveyor of puck history and other tales: Stompin Tom Connors. America may have its King of Pop, but Canada has its King of Pucks! Uh...Wait...Canadians were watching the MJ funeral/memorial service? Why would they care to see that? Hoping for another Janet Jackson wardrobe malfunction? David: For some reason I had trouble telling Janet and Latoya apart. I think that we were all shocked that we would never be able to see his full transformation. Now that his memorial service is over it is ok to see him as wacko again. He was definitely a complex and bizarre character- no denying that talent, but no denying that he was quite troubled. Nanodance: Troubled and talented - I'd have to agree. Do You Want Pants With That?